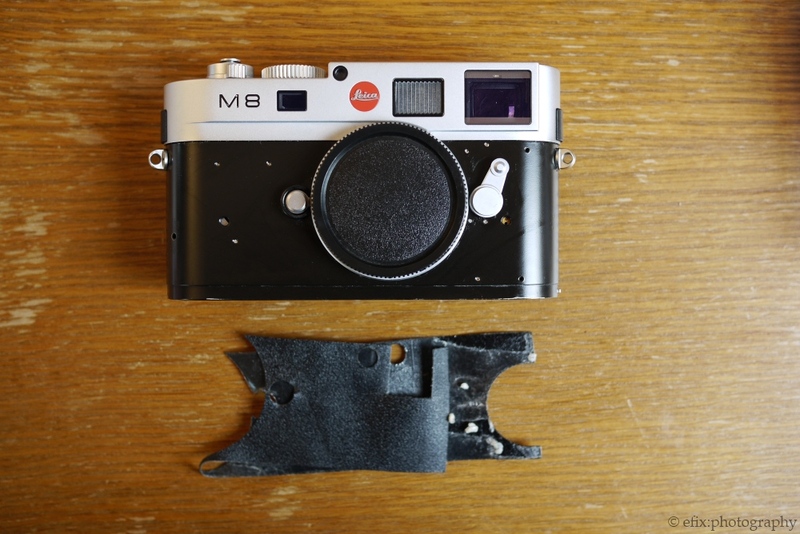 Re-skinning the Leica M8 « efix:photography – News. Thoughts. Pictures. Thus, very early, I desired to give my M8 a new leathering. 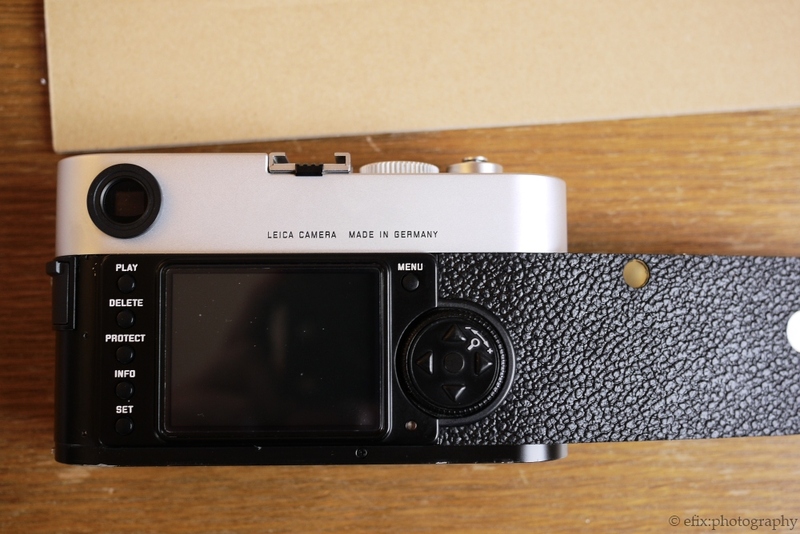 However, at that time, the only supplier for M8 leatherettes was cameraleather.com (if you did not wish to send your camera in to Leica themselves). They have some very nice leathers in their product lineup, but they’re all relatively expensive. Then I remembered that when I got my Olympus E-P1, I ordered a custom leatherette from the Japanese manufacturer Aki Asahi, for much the same reasons that I now wanted one for my M8: grip. And also looks. But the E-P1’s metal finish in particular proved very slippery, and also attracted finger prints due to its shiny surface. 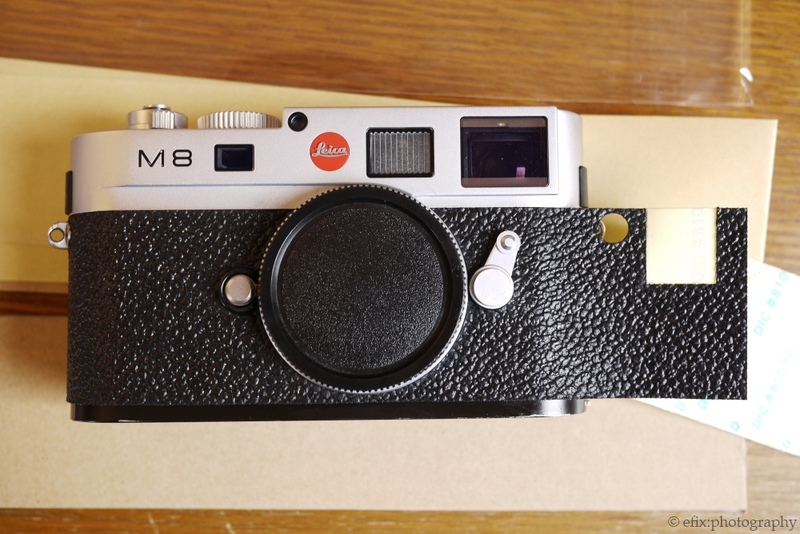 However, Aki Asahi were only offering custom coverings for analog M models, not for the digital M8 or M9. That is, until very recently. 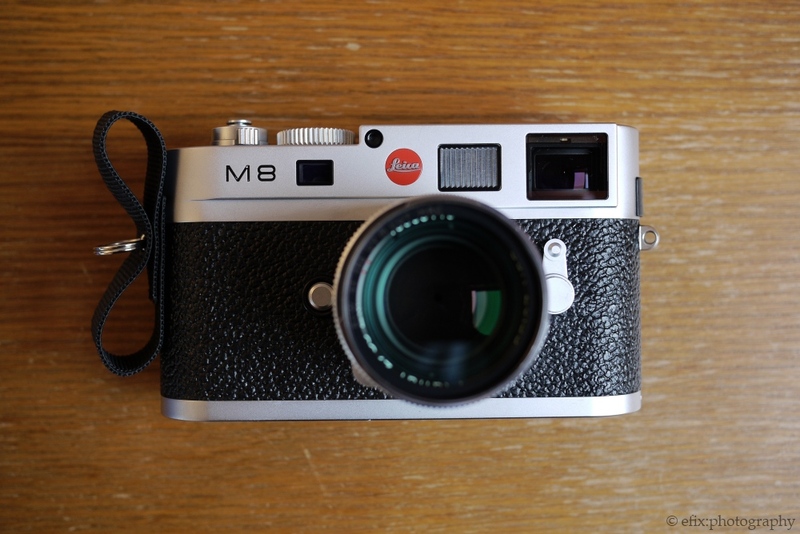 When I revisited their website a few days ago, I noticed they had introduced a custom covering for the Leica M8 around mid-March. Finally! I immediately placed an order for the #4034 style called “Pebbled Emboss”, which looks very similar to Leica’s vulcanite covering. Today, I received the shipment and immediately fitted my M8 with the new leatherette. And what can I say — not only does it look so much nicer, I also find that grip is much improved by the more pronounced structure of the #4034’s surface. Applying the leatherette was pretty straightforward, as you can see in the pictures below. For anyone who’s contemplating to re-skin his M8 or M9 (the coverings should fit the latter as well, as M8 and M9 share practically the same body), I can only recommend Aki Asahi. Their service as well as their products are excellent. And for a price of US-$ 28, including shipping, there’s really no reason not to go for it. First, I stripped the M8 of her original "sandpaper" covering and cleaned the body from residue using nail polish remover. Poor thing, all naked! Aki Asahi ship their coverings in sealed plastic pouches wrapped in cardboard. 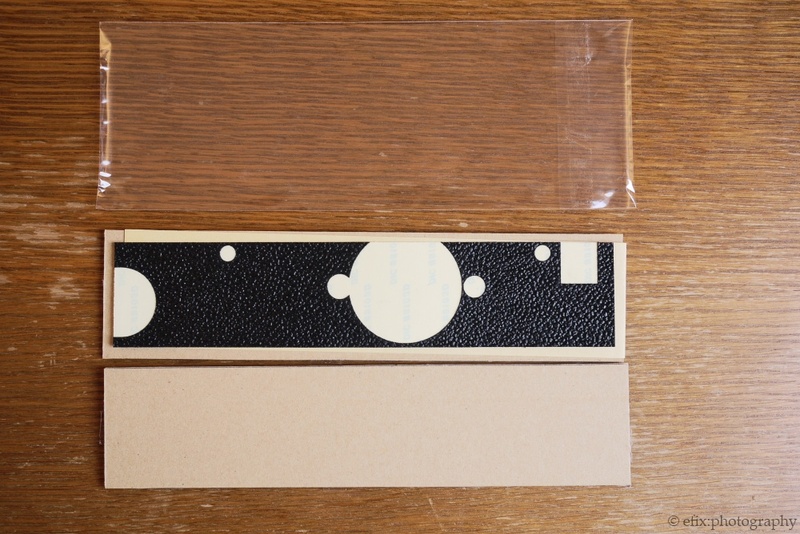 The M8 leatherette is one continuous piece, the back is already covered with an adhesive. Starting the re-covering process on the back. Attaching the leatherette on the right hand side was easy; however, on the left, with the frame selection lever, things became a bit fiddly. But I succeeded at last! And finally back to the back of the camera. Fits perfectly! The final product, adorned again with the Leicagoodies Sling, the 9days.hk silver chrome mini soft release, and the 50mm Planar ZM. Ready to go! UPDATE: Before you guys all go ahead and reskin your M8s, here are two hints I missed. Cover the adhesive side of the leatherette with water or alcohol before applying it. This way, you can reposition it before it beforenit gets real sticky. I did this when I covered my Olympus E-P1 with their #4040 skin. Start with the frameline preview lever. This makes things much easier and significantly reduces the chance of ripping the whole leatherette apart. 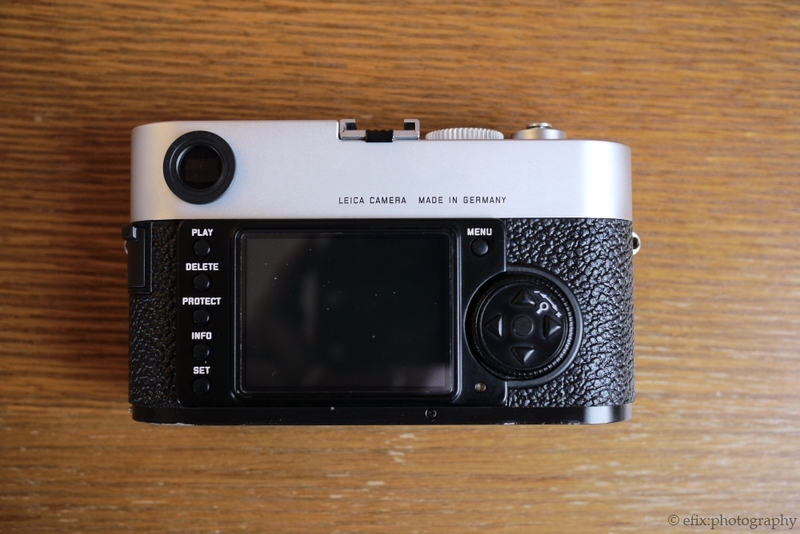 See John Sypal’s blog post on re-skinning his Leica MP. Looks really nice. How do you get the leatherette over the frameline lever ? Hi Doug, thanks for stopping by! The proper way to do it is to unscrew the frameline selection lever; however, you need a special tool to do that. The covering has a cutout for the same size as the bottom part of the frameline selection lever. It was a bit fiddly to get it over the lever, but it was doable. Just try not to get the leatherette adhere to the body in the wrong place — the adhesive is quite sticky! Great guide! One tips though for those who look at the guide. You can apply a little sanitation gel (the alco-gel WITHOUT moisturizer) to the body. This will enable you to slide a little with the leatherette before it settles, hugely improving the frame view lever dilemma. I bought my from cameraleather.com and was really happy with their product! Then my M8 took a turn to Solms where I asked them to put on the M8.2’s leather instead of the normal one, since they were going in there anyway. Yes, you’re right about the trick making the adhesive less sticky. Works with water as well, see my post on attaching an Aki Asahi leatherette on the E-P1. Cover the adhesive side of the leatherette with water before applying it (makes it less sticky for repositioning) and start with the frameline lever. (See my updated blog post.) Cheers! Absolutely — I think it feels so much nicer in the hand with a “proper” leatherette Btw, I’ve also fallen in love with Steve Barnett’s Thumbie, which is a thumb rest similar to the Thumbs Up, only that it’s smaller and is attached to the camera with sticky tape. Anyway, during my vacation which I just got back from, I realised how much more comfortable the handling of the M8 was with the various tweaks and upgrades I have given it over time. You really have to giggle when websites like the camera skin site have to put “camera not included”. Are their really people out there dim enough to think it came with a free M8 ??? I think it is standard procedure nowadays to state EXACTLY what is part of the actual product in a product picture, so not to be sued afterwards. Crazy world.